Get ready LA… ROA is coming soon! 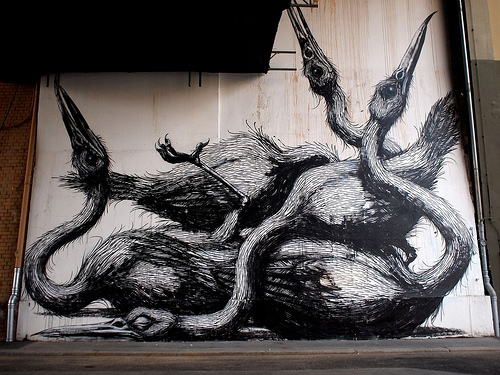 ROA lands into LA on October 28th… more to come very soon! Posted on October 24, 2010 December 29, 2016 Author Andrew HosnerCategories Muralism, Thinkspace FamilyTags ROALeave a comment on Get ready LA… ROA is coming soon! Dabs Myla are EVERYWHERE. 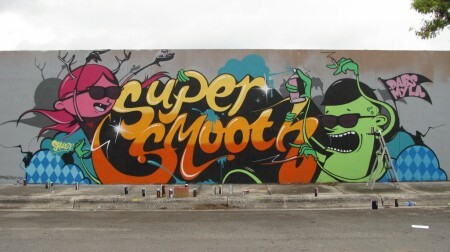 Jet Set Graffiti teamed along with the duo when they recently did a wall in downtown LA as part of the LA Freewalls Project. Los Angeles County sheriff’s deputies today arrested at least eight alleged members of the notorious Metro Transit Assassins tagging crew, some of whom are believed to be responsible for a several-blocks-long “MTA” tag in the concrete Los Angeles River bed that authorities say will cost millions of dollars to remove. The arrests occurred during a series of early-morning raids centered in the Hollywood area. Among those detained for a parole violations is a famous tagger whose work “SMEAR” has has won acclaim in the art community. But hazardous-materials crews must then dam and capture all the paint and water runoff to prevent it from getting into the river. The crew did an additional $20,000 worth of damage to transit vehicles and facilities. 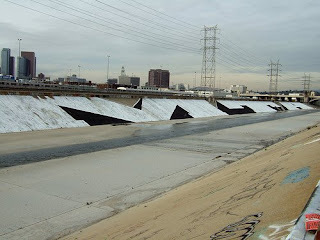 Finkelstein said the Los Angeles River “MTA” tag, in a vast industrial district east of downtown between two rail yards, took about 400 gallons of paint — 300 gallons white and 100 gallons black. “It took them four nights to do it,” he said. The three block letters cover a three-story-high wall and run the length of several blocks between the 4th Street and 1st Street bridges. The tagging crew, which is also known as “Melting Toys Away” and “Must Take All,” began about the time the transportation agency began using the MTA letters. Investigators say they have statements, including some on video, that implicate some of the crew members in the enormous tag. To grasp how HUGE this tag is, watch this video. Our thoughts go out to these guys. Let’s hope they don’t throw the book at them too hard. ELBOW-TOE has been at this street art game for a long time, and Jet Set Graffiti recently joined him as he discusses his perceptions of street art, studio art, and the way that both aspects of his work relate to each other. 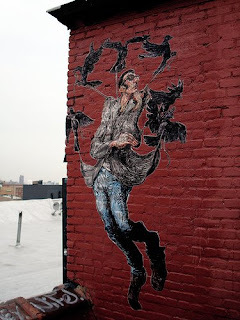 From his raw paste-ups on the street, to his intricate and highly detailed collage work inside, his work is unsurpassed in both talent and emotion. Look for ELBOW-TOE with ARMSROCK (also interviewed recently by the Jet Set folks) at his upcoming show at Thinkspace opening on December 12th… more soon.